We hosted two great volunteer events this month: spring stream monitoring on May 6th and stewardship day on May 20th. The stream monitoring went off without a glitch, collecting samples from four sites along Cold Creek. The teams sampled a 100 yard section of the creek for 30 minutes, targeting areas that are prime habitat for macroinvertebrates such as under the creek bank or the underside of submerged trees. Once the samples were collected they were brought back to the center to be filtered. 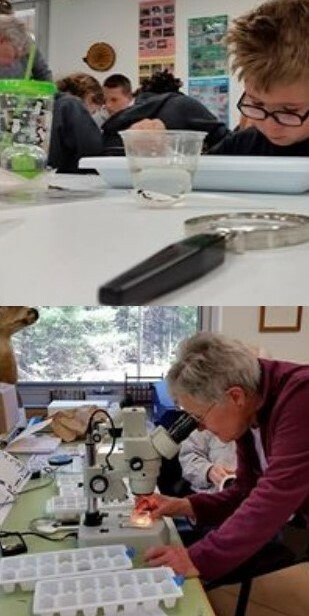 The samples were then brought inside and sorted through by our “pickers” for one hour, separating different bugs in ice cube trays. After an hour of picking, the bugs in the ice cube trays were ID’ed, counted and preserved. This data is then submitted to MiCorps where it will be compiled with lots of other statewide stream data and will be used to develop water management plans. This information is also good for us to assess the health of our cold water streams and observe any yearly changes that may be occurring based on the types and abundance of macros that we find. Thank you to all of our Citizen Scientists who are a part of monitoring the health of our beautiful waterways. Our spring stewardship day felt like many other stewardship days at GRNA, not quite knowing what the weather will do until the morning of the event. It hasn’t been often that we have a stew day and are confident in a warm, sunny day ahead. That’s the kicker with stewardship day, it can definitely be done in not so great weather conditions but it’s a whole lot easier to coordinate outdoor projects when the weather abides. Well the weather did abide and lo and behold we had a gorgeous morning handed to us. With blue sky and sun overhead we accomplished many projects on that Saturday. A volunteer blew off the boardwalk trails from the woody debris left behind from the winter months. A crew of volunteers finished washing the exterior of the center, a project that was started last fall. The native gardens around the center were cleaned up, weeded and mulched. New plants were planted in the Serenity Garden and Meadow Garden. 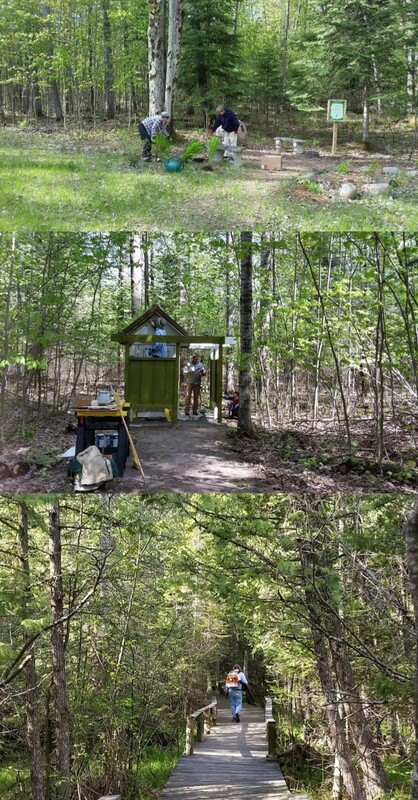 The yard around the center was mowed and lastly, the outhouses by the parking lot were painted, thanks to generous paint donations from a wonderful GRNA supporter and Sherwin Williams. 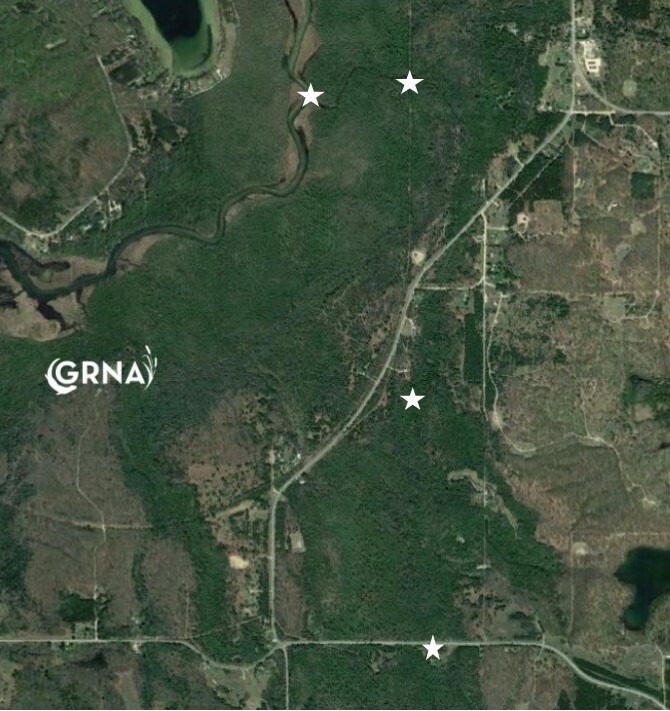 All of these projects make such a huge impact on GRNA. They are simple, but necessary tasks that allows for staff to focus on other projects, improve the visitor experience and increase the chances that visitors will tell others about their positive experiences at GRNA. Thank you for contributing to GRNA! Join the Bellaire community to celebrate all of our awesome trails! 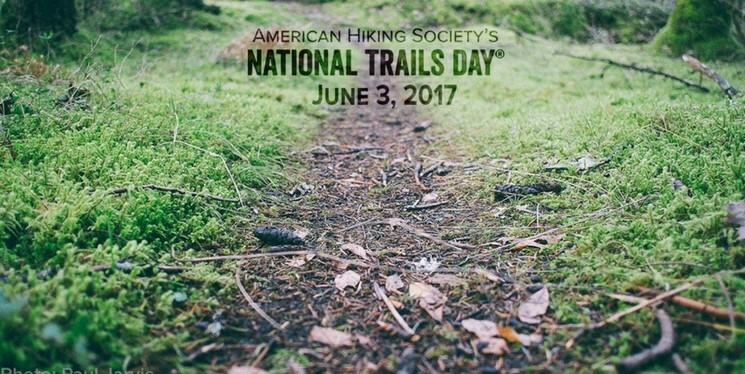 Stamp your National Trails Day passport for an afternoon of FREE guided trail hikes, bike rides, paddling, open houses and children activities hosted by Grass River Natural Area, Antrim Conservation District, Glacial Hills, Norte!, Paddle Antrim and Bellaire Boy Scouts. 5 pm--Paddle Antrim community paddle. We'll be starting from Richardi Park and headed north up the river towards Intermediate Lake. Arrive at 5pm for a 5:30pm launch. As you may have already heard we had a last minute cancellation of Vox Vidorra for our annual benefit concert. 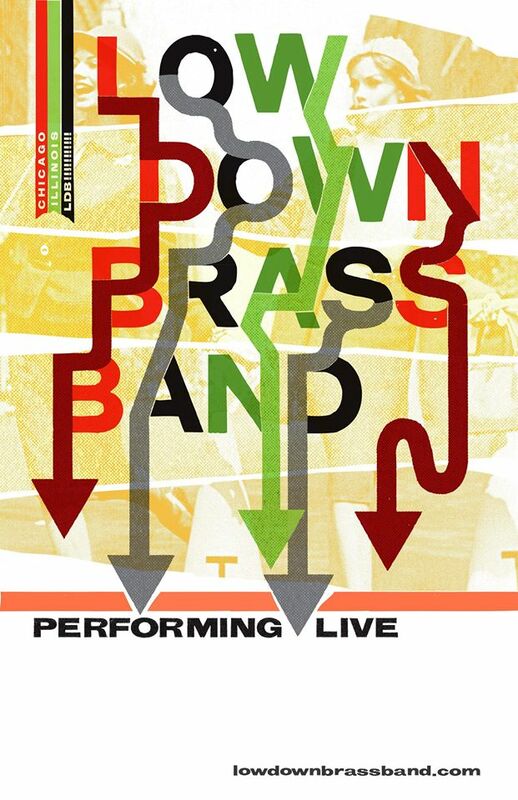 But do not fear—the show will go on and will be now featuring LowDown Brass Band out of Chicago. This horn-driven ensemble has so much energy you won’t be able to help yourself from getting up onto your feet and busting out onto the dance floor. And with Turbo Pup opening up, it is bound to an evening to remember. We are excited to have both of these bands perform for us and hope that you will come out to experience this amazing group of musicians. For tickets and more information go HERE. There are still volunteer openings for the evening as well, including the newly added raffle ticket sales. This is an easy way to see some great music at no cost. For openings and to sign up go HERE. Every Tuesday from 10 am to 12 pm you can learn about wildflowers and birds at Grass River with Julie Hurd on our Wildflower and Bird Walks. The last bird walk in our Birding Series will be on Saturday, June 3rd at 9 am. This program will focus on Nesting Birds where you will see some examples of some nests and learn how to ID birds by song and habitat. On Thursday, June 8th Grass River Reads will meet at 10 am to discuss “Braiding Sweetgrass” by Robin Wall Kimmerer. This delightful book explores the ways our lives and language weave through the natural world. 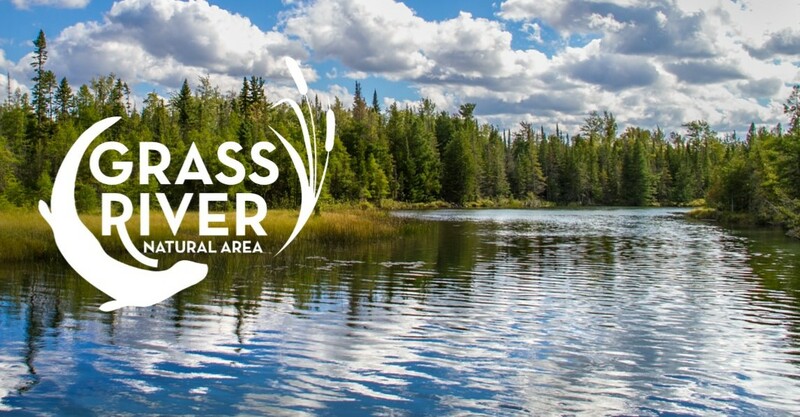 Finally, join Master Fly Fishing Instructor and Licensed Guide, DJ Schmidt, for a presentation on ”The Ecology of Fly Fishing.” This hands-on program is for all levels of experience. For more information about all of our programs visit HERE or call (231) 533-8314. For those of you who may not have seen the last newsletter, the Volunteer Handbook is available for your reading enjoyment on the volunteer page of our website. 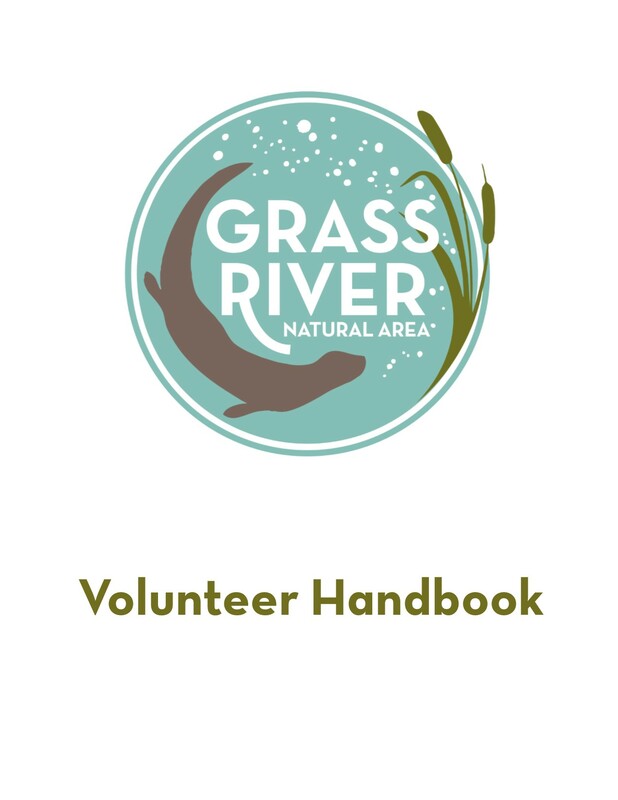 There’s some great information in there about your volunteer role at GRNA and I encourage you to check it out if you haven’t already. If you like to get down to great music while helping a great organization, then this volunteer opportunity is for you! We have a variety of needs for this event, from helping guests get registered to selling drink tickets to distributing cookies and ice cream, and there is bound to be one just right for you. Check out volunteer openings and sign up HERE or contact me with any questions. Check out updated events on our website, facebook or twitter. Copyright © 2017 Grass River Natural Area, All rights reserved. You are receiving this email because you have volunteered at GRNA or have opted in on our mailing list.